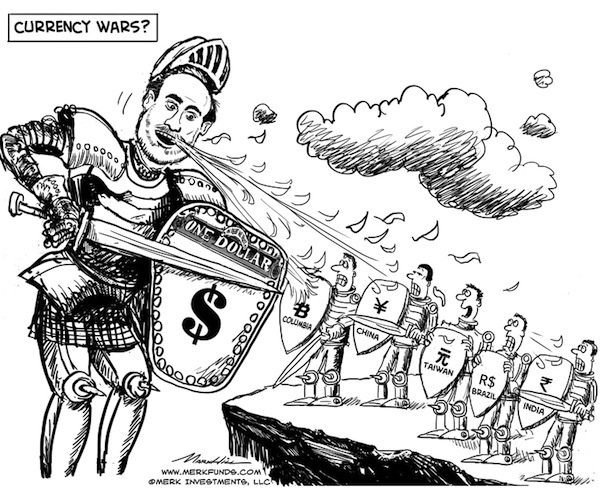 Currency Wars: Is the US on the Attack? Doubling down on QE3, the Federal Reserve (Fed) Chairman Bernanke tells China and Brazil: allow your currencies to appreciate. One does not need to be a rocket scientist to conclude that Bernanke wants the US dollar to fall. Is it merely a war of words, or an actual war? Who is winning the war? The cheapest Fed policy is one where a Fed official utters a few words and the markets move. Rate cuts are more expensive; even more so are emergency rate cuts and the printing of billions, then trillions of dollars. As such, the Fed’s communication strategy may be considered part of a war of words. Indeed, the commitment to keep interest rates low through mid-2015 may be part of that category. But quantitative easing goes beyond words: QE3, as it was announced last month, is the Fed’s third round of quantitative easing, a program in which the Fed is engaging in an open-ended program to purchase mortgage backed securities (MBS). To pay for such purchases, money is created through the strokes of a keyboard: the Fed credits banks with “cash” in payment for MBS, replacing MBS on bank balance sheets with Fed checking accounts. Through the rules of fractional reserve banking, this cash can be multiplied on to create new loans and expand the broader money supply. The money used for the QE purchases is created out of thin air, not literally printed, although even Bernanke has referred to this process as printing money to illustrate the mechanics. Why call it a war? It was Brazil’s finance minister Guido Mantega that first coined the term, accusing Bernanke of starting a currency war. Here’s the issue: like any other asset, currencies are valued based on supply and demand. When money is printed, all else equal, supply increases, causing a currency to decline in value. In real life, the only constant is change, allowing policy makers to come up with complex explanations as to why printing money does not equate to debasing a currency. But even if intentions may have a different primary focus, our assessment is that a central bank that engages in quantitative easing wants to weaken its currency. It becomes a war because someone’s weak currency is someone else’s strong currency, with the “winner” being the country with the weaker currency. The logic being a weaker currency promotes net exports and GDP growth. If the dollar is debased through expansionary monetary policy, there is upward pressure on other currencies. Those other countries like to export to the US and feel squeezed by US monetary policy. Given that politicians the world over never like to blame themselves for any shortcomings, the focus of international policy makers quickly becomes the Fed’s monetary largesse. Axel Merk the president and chief investment officer of Merk Investments, the authority on currencies, and manager of Merk Funds, a suite of no-load currency mutual funds that typically do not apply leverage.